We've all rocked, pumped up the volume, and sang-along to The Eagles' greatest –"Take It Easy", "Take It To The Limit", "Lyin' Eyes", "Best of My Love", "Heartache Tonight", and of course, "Hotel California". But what if the heady guitar riffs were played on violins, strings, horns, and a grand piano to boot? 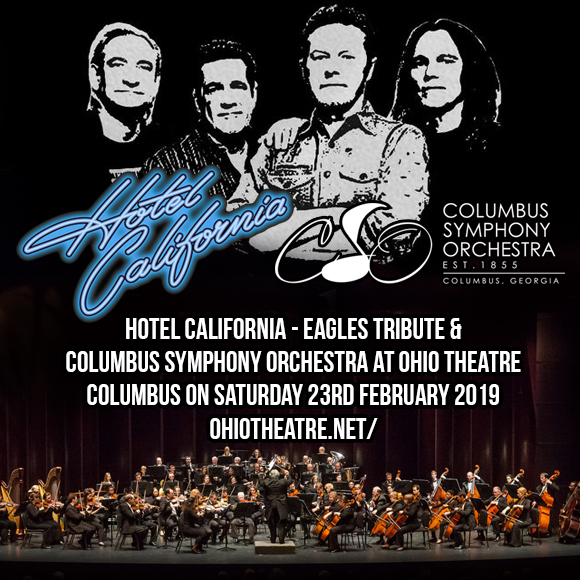 The Hotel California – Eagles Tribute & Columbus Symphony Orchestra would be a grandiose and mind-blowing experience that you should not miss! Happening at the Ohio Theatre – Columbus on Saturday 23rd February 2019, this rock-meets-symphony extravaganza is getting ticket sales on a roll! A must-see event, so get those must-buy tickets now! The heart of rock and roll music beats to the timeless influence of the music of The Eagles. Since the 70's, The Eagles have been flying high above the rock stratosphere. With their greatest hits like "Take It Easy", "Take It To The Limit", "Lyin' Eyes", "Best of My Love", "Heartache Tonight", and of course, "Hotel California", The Eagles created an impact that reverberates to this day. Thus, it comes as no surprise that music lovers love to hear The Eagles music in different renditions and interpretations. The Eagles played by a symphony orchestra will simply rock one's senses and would take their electrifying sound to another level. Hotel California – Eagles Tribute & Columbus Symphony Orchestra may sound like an unlikely combination but the symphony masters of the oldest performing arts organization in the city of Ohio has worked its magic, rendering a spellbinding interpretation of certified Eagles' classics, plus bonus performances of some titles from the solo works of Don Henley, Glen Frey, and Joe Walsh. This performance is said to have been duly authorized by The Eagles themselves. At the helm of this musical spectacle is Stuart Chafetz as Conductor, who steered the orchestra into faithful and accurate renditions of Eagles' hits. Fans of the symphony and fans of The Eagles are in for an absolute treat. Tickets are now available. Get your tickets now!